The Invacare Taurus electric scooter can travel at up to 4 mph, climb 12° ramps and mount 4″ / 10cm kerbs with ease. A 450w motor is fitted to provide the power, performance and reliability you require. The Invacare Taurus electric scooter will quickly and easily dismantle so that it can be transported in your car, or for storage purposes. This scooter offers both on and off board battery charging, meaning that the battery doesn’t need to be attached to the scooter to be recharged. The Invacare Taurus disabled scooter has a fully adjustable seat and tiller, to provide you with the most comfortable driving position. Easy to use controls are fitted as standard. 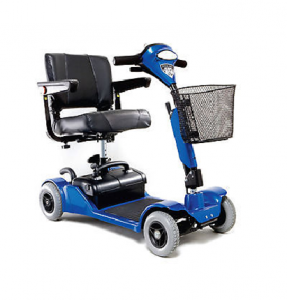 There are many optional accessories available for the Invacare Taurus electric scooter, including a lockable front box, rear basket, and oxygen cylinder holder. The Invacare Taurus mobility scooter has a maximum range of 15 miles and a maximum weight capacity of 20 stone / 127Kg.